This gluten free lasagna with pesto sauce is a vegan recipe, typical of Italy and suitable for those coeliacs that don’t eat meat. Moreover, this lasagna is handmade and preservative free. 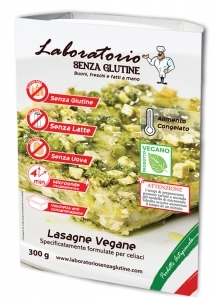 Our gluten free lasagna is packaged in a practical anti-contamination bowl (single pack or family pack). After a couple on minutes in the microwave, coeliac people too can taste this great italian food. Potatoes, rice flour, string beans, potato starch, tofu (water, soy, magnesium chloride), carrot, onion, basil, pine nuts, sunflower oil, extra virgin olive oil, guar flour E412.